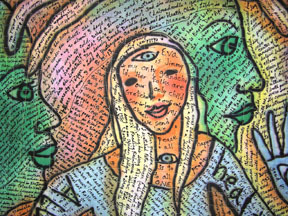 by Susan Shie. Turtle Moon Studios. Here are my major art quilts of 2014, with the newest one at the top, and going down to the first one finished in 2014 at the bottom. 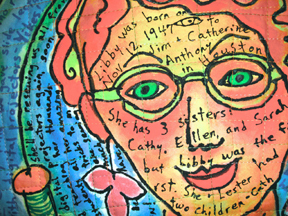 Click on the tiny images here, to go to each piece's main page, where I have LOTS of images and a long artist's statement for that piece. Thank you. Above: "ER: Page of Potholders (coins) in the Kitchen Tarot." 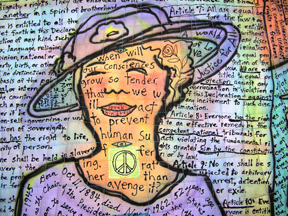 (Eleanor Roosevelt and Human Rights) 60"h x 36"w. Made from October 15 to November 25, 2014. 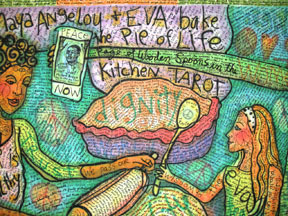 Above: "The Pie of Life: Page of Wooden Spoons (wands) in the Kitchen Tarot." 58.5"h x 89.5"w. Made from June 20 to Sep 3, 2014. 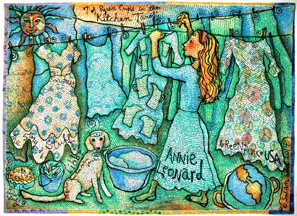 Above: "Annie Leonard: 7 of Pyrex Cups in the Kitchen Tarot." 59"h x 81.5"w. Made from March 8 to June 18, 2014. 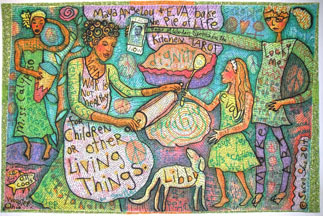 Above: "For Love of Libby. "30"h x 30"w. Made from April 7 to April 15, 2014. 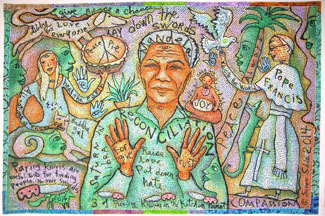 Above: "Mandela: 3 of Paring Knives (swords) in the Kitchen Tarot. "60"h x 90"w. Made from November 20, 2013 to February 10, 2014. 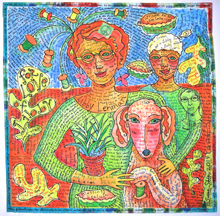 Video of Susan Shie's solo exhibition interview at the Festival of Quilts in Birmingham, England, by Andrew Galli. August, 2010. Web site design © Susan Shie and Jan Cabral 1997. 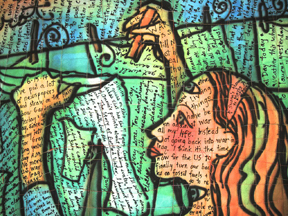 All subsequent web site work, ©Susan Shie 1997-2015. This page updated by Susan Shie, May 25, 2015. Web site hosting by Key to the Web, Ltd. ©2015.